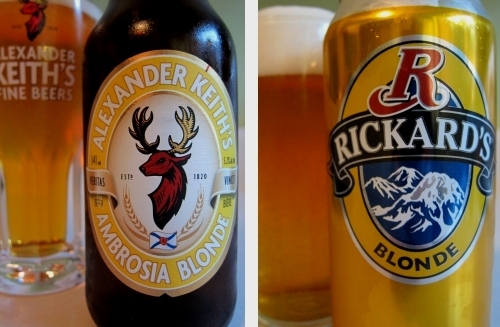 While it’s unlikely that either company would freely admit to it, it’s easy to get the impression that Labatt and Molson have been shadowing each other with their respective Keith’s and Rickard’s brands in the last few years, leading to a pair of pseudo-craft portfolios that are strikingly similar in their line-ups. The latest parallel between the two is the recent and nearly simultaneous launches of Keith’s Ambrosia Blonde and Rickard’s Blonde. While there are some differences between the two – the Keith’s is an ale while the Rickard’s is a lager; the former is a limited Brewmaster Series release while the latter appears to be a new year-round product – the similar names and the arrival of promo samples of both within a week or so of each other made it impossible to resist doing a head-to-head review of the pair. Back in 2003, I attended a fantastic event presented by Sleeman to promote the fact that they had recently taken over distribution rights for Samuel Adams beers in Canada. For just 20 bucks, attendees were given ample servings of four standard Sam Adams beers, including the flagship Boston Lager, along with understandably less generous samples of the brewery’s legendary big beers: Triple Bock, Millennium and Utopias. The implied message seemed to be that Sleeman had big plans for the brand, and we could look forward to seeing more Sam Adams beers on at stores and bars in Ontario soon. Sadly, that implication ended up being a misinterpretation, as all we saw on the shelves in the next few years was Boston Lager and fleeting appearances by Sam Adams Summer Ale. But last year, Sam Adams severed ties with Sleeman and joined forces with Moosehead, a partnership which has led to more Sam Adams beers being released in Canada, including the infamous Utopias as well as some of their less expensive and more accessible seasonal beers. The latest arrival is the Samuel Adams Noble Pils (LCBO 239525 – $13.55/6×355 mL), which I’ve been enjoying the hell out of since it hit LCBO shelves a few weeks ago. Pouring a vibrant yellow-gold with a thick and fluffy snow white head, it has a gorgeous aroma of honey, floral hops, a bit of citrus and caramel. On the palate, it’s crisp and clean, providing a perfect backdrop to the delicious and well-balanced flavour that features sufficiently sweet malt intertwining with those beautiful hops, which bring in notes of herbs, pine, pepper and grapefruit. Here’s something that proves I still have a lot to learn about whisky: When I see “Isle” on a label, I expect something peaty and smoky to come out of the bottle. Not only because I love whiskies in that style, but because “Isle” makes me think of Islay, the Scottish island where almost every whisky they make fits that template. But then I remember that there are distilleries scattered across other islands that produce whiskies in a variety of styles, from soft and sweet to full of peat. This 10YO from the Isle of Arran Distillery leans more towards the sweet side, although the aroma starts with a bit of sea and smoke before elegant notes of vanilla and cream come through. The mouthfeel is soft and supple, and the flavour holds a nice combo of melon, vanilla, coconut, pear, subtle oak, and a hint of spice in the finish. Not one to wow the crowd, but for an everyday easy drinking malt, it’s a great choice. When choosing which beers to write up from the seasonal releases, I usually pick ones that are first timers, as they may need a bit more attention than those that have been on the shelves here before. But I’ll make an exception for Christoffel Blond, as it’s a beer that I will praise any chance that I get. Plus it allows me to poach from an earlier review, when I described it as having “a rich golden hue and a good sized snow white head”; an aroma that “reveals a strong herbal and floral hop character, with some candyish notes as well”; a body that’s “crisp and full and quenching”; and a flavour that is “a tasty combination of sweet orange candy, sharp green herbs, and a refreshingly bitter citric finish.” Gorgeous stuff that I drink loads of every time it shows up in Ontario – and it’s great liquid for steaming mussels as well. Earlier this week I got a sneak peek at some new items on the food menu at Bier Markt – the highlights of which I’ve covered in a post over on Taste T.O. 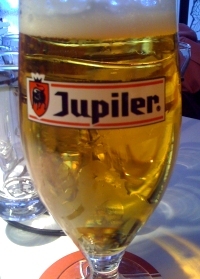 – and launching at the same time was the latest exclusive addition to their draught beer line-up, Jupiler Lager. I’m well aware, of course, that Jupiler isn’t exactly held in the highest regard among serious beer drinkers, as typified by a response to one of my tweets that evening reminding me that it’s “the Coors of Belgium.” And yes, it’s a bit unfortunate that it’s position as Belgium’s top-selling lager gives the marketers an opportunity to give it a higher cachet than it may deserve. 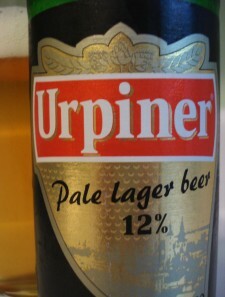 Still, as far as mainstream mass-produced lagers go, it’s fine enough. The mild herbal edge in the aroma indicates that there are actually some hops in there, and while the flavour is simple, it’s also clean and mostly balanced, with pleasant lightly toasted grains off the top, and a smidgen of cut-grass hops joining in. However, it falls short in the finish, where the corn that’s added as a adjunct makes itself known very clearly and much too sweetly. So no, it’s not a great beer. But it’s not an awful one either, and as I note in my Taste T.O. write-up, the folks who like Stella and Heineken will be more than happy with it. Tagged lager, macrobrews, Taste T.O. Yes, I know that I still owe you all several more Toronto Beer Week recaps. Although it’s starting to get to the point where I’m almost embarrassed to be writing about it so long after it happened. So we’ll see. In the meantime – it’s been a bit of awindfall of free beer around these parts lately, so I figured I should start writing about some of it before I get a bad name for myself as that goddamn freeloading so-called “beer blogger” who never keeps up his end of the bargain. 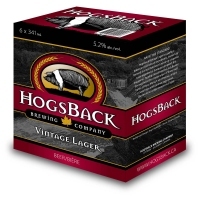 First up: HogsBack Vintage Lager from HogsBack Brewing Company, a fairly new venture that started up in Ottawa earlier this year. Like their fellow Ottawa newcomers, Kichesippi Beer Company, HogsBack has started as a contract operation, with their single brand being brewed for them at Cool Brewery here in Toronto. Aside from where the beer is brewed, they’ve been a steadfastly local concern, selling their beer only on tap, and only in the Ottawa area. The first of those will soon be changing, though, as they’re getting set to launch their Lager in bottles sometime in the next couple of months, with plans to sell it in six-packs at LCBOs in and around Ottawa. A couple of weeks ago, Paige Cutland – one of the four partners behind HogsBack – dropped me a note saying that he’d be coming through Toronto and would like to drop off some bottles for me. I was expecting a couple of bottles, or maybe a sixer, so I was surprised when he showed up with a full case (fellow Toronto beer bloggers: I’ll be in touch soon to share the wealth…), but it’s given me a chance to try a few bottles to form a solid opinion of the beer. And that opinion is: It’s good. Not OMG BEST BEER EVAR!!!!!!! good, but also not one of those so-called “premium lagers” that is really just a very small step up from macrobrew. It pours a pale gold with a respectable white head, very much looking the part of a “European-inspired lager” as self-described. Aroma starts with some husky malt with a touch of fermented fruit sweetness and clean grassy hops. The palate is a bit sticky/oily, and the flavour is a bit sweeter off the top than what I personally prefer in a golden lager, but it balances out in the middle as some of the huskiness suggested by the aroma comes through, followed by light but fresh and zippy Saaz hops in the finish. So, like I said – good. Not something I’d travel to Ottawa for, but if I lived there, I wouldn’t mind it being one of my hometown beers. Over on Taste T.O. this week, I’ve got a review of Muskoka Pilsner Light, a newish beer from Muskoka Cottage Brewery that is “Light” due to being 4% alcohol, but is otherwise a solid and flavourful German-style pilsner. In the piece, I make the point that the name – which I assume was chosen at least partially to get the beer noticed by drinkers of Coors/Bud/Blue/etc. 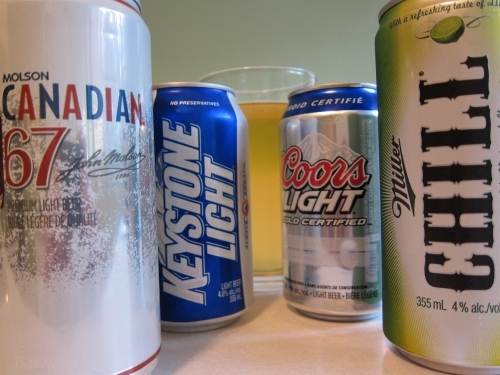 Light who may be willing to experiment a bit – might end up alienating Muskoka’s core customer base of craft beer drinkers who would sooner drink water than a typical North American Light Lager. I have hope that the quality of the beer – which is quite high – will win it fans regardless of the name. But there’s still a big reason why so few small breweries call their beers “Light” even if they happen to be lower alcohol lagers, and that reason is that most mainstream light lagers simply aren’t very good. Not that they’re completely undrinkable (well, some of them, at least), but they inevitably lack some or all of the elements that craft beer drinkers look for in a beer – elements like colour, body, aroma and flavour. I recently had a chance to reconfirm my opinion about macrobrewed light lagers when I received a promo shipment from Molson Coors Canada containing a selection of beers from their portfolio, ranging from light and ultra-light lagers to craft and pseudo-craft brews. I’ll give some thoughts on the beers in the latter category in a subsequent post, but for this one, I’ll be concentrating on the quartet of cans in the former group. Tagged lager, light beer, macrobrews, Taste T.O. A few weeks back, I did a write-up for Taste T.O. on Moosehead Light Lime and Red Baron Lime, a pair of beers that hit the shelves in Ontario in the dying days of summer, attempting to ride to coattails of the incomprehensibly popular Bed Light Lime. You can click through to read the whole thing if you’d like, but the condensed version is that neither of them is especially good when judged purely as a beer, but the Red Baron was at least a drinkable and somewhat refreshing beverage. Soon afterwards, I got an email from Adam Moffat, a rep from Molson who I’ve met a couple of times, with an offer to send me a sample of Miller Chill. 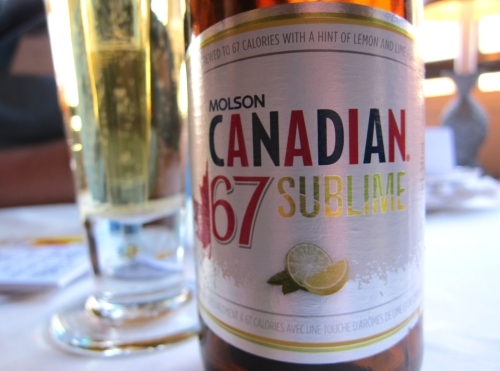 While not available in Ontario, Molson has recently introduced it into the Alberta market, and Adam was curious to know what I might think of it, even given my general dislike for the lime beer gimmick. I took him up on the offer, making it clear that he shouldn’t expect a glowing review, and he followed through with a delivery a couple of days later. It pours a pale gold with a small white head that disappears remarkably quickly. The aroma is initially not so pleasant, offering that stale malt and wet corn husk smell that I get from many mass produced lagers, but that slowly clears and is replaced with notes of candyish lime. The body is thin and crisp, as expected from a light lager, and the flavour holds very little that can be described as “beer-like” – it’s more reminiscent of Sprite with a very, very faint wisp of malt. Bottom line: Like the three aforementioned products, this is not a brew for serious beer drinkers. It’s for people who want to throw back a few lightly flavoured and slightly sweet alcoholic beverages on a patio, or at a party, or in other situations where people drink a lot without really thinking about what they’re drinking. Regardless of how much it may offend my pretentious beer geek sensibilities, there obviously is – and always will be – a large market for such beers, and for better or worse, Miller Chill serves that market well. Due to the unique (or in less politically correct terms, fucked up) nature of alcohol legislation in Ontario, there are several different ways for beer to enter the marketplace. There are two retail chains – the government-owned LCBO, and the Molson & Labatt owned Beer Store – but getting on the shelves of the former requires approval by the powers-that-be, while listings at the latter are quite expensive. Because of the time, money and/or red tape involved in getting beers into the province’s retail market, much of the beer imported into Ontario, especially from smaller breweries, is sold straight to bars, restaurants and individuals by import agents via the LCBO’s Private Order and Consignment programs. The result of this is a larger selection of beers being available than store stock suggests, but beer hunters often have to be intrepid to track them down, especially the lesser known beers that are brought in for specific ethnic communities, and that end up at bars and restaurants that aren’t necessarily known for having varied beer selections. It helps, of course, when the importers do some outreach to try and spread the word about their goods. An example of this is an email I received a few weeks ago from James Tubaro of Oxford Imports, an agency that usually deals with wine, but that recently started carrying Urpiner Ležiak Svetlý, a pilsner from Slovakia’s Banskobystricky Brewery. He dropped off a few bottles for me soon after, and while drinking the final one tonight, I thought I should share some thoughts on it. My main thought is that it’s a pretty nice beer, comparable to many of the European pilsners that are easily available at the LCBO. It has a beautiful golden colour and a snow white head, and an aroma that’s a touch too sweet for the style, but with a nice bready character and a herbal hop edge. The flavour is very pleasant – fresh bread, some toasted grain, a hint of honey, and very nice, lingering herbal hops in the finish. Again, it’s a bit on the sweet side for a pils, but still a nice little brew. Tubaro tells me that he’s submitted the beer to the LCBO for retail consideration, so perhaps it will some day join Golden Pheasant on the shelves to make a grand total of two Slovakian beers easily available to Ontario drinkers. For now, though, he’s got it in a number of bars and restaurants around Toronto. So be alert, beer hunters.